Everything in life has its unpleasant or uncomfortable side. These aspects cannot be removed from life. There was once a bat for whom having to go out and hunt insects was just a terrible amount of effort. He was such a lover of comfort that, one day, when he happened to look through a window and saw a bird in its cage, and that it was given all its food and water without having to do anything at all, the bat decided to become a child’s pet. The bat changed his whole routine. He got up at dawn to fly to parks so he could be spotted by some child who might adopt him as a pet. However, as bats aren’t particularly attractive, the children paid him little attention. So the bat decided to improve his appearance. He made a beak, stuck a load of feathers to his body, and learned how to whistle so that his bat calls weren’t quite as horrible as before. And so it was, that with great good fortune, he met a little boy who hardly every wore his glasses and was so short-sighted that this strange-looking black little bird’s ridiculous appearance didn’t really matter. Some days later, the batbird managed to escape the cage and return home. He was so ashamed and embarrassed that he made sure he told no one what had happened. 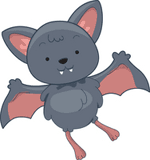 However, he couldn’t stop the other bats commenting on how much effort he now made when they were out hunting flies, how strong and tough he had become, and how he no longer seemed to worry about the inconveniences and discomforts of living in freedom. How do you think the life of someone who constantly complains about day to day things is? Do you think that complaining will help them to be happier? What do you think is the best way to improve your life? Talk to your child about those little day to day things you dislike but you don't pay attention to. Explain your little tricks to better cope with them and how this attitude helps you become stronger. To improve the strength of your child and that of the whole family in a joyful way, try the "Batbird Menu": once a week, each one of you will eat something you don't like. Anyone who complains will be the "Batbird of the week" and will not eat the delicious dessert that completes the menu. Make it even funnier with some bat related decorations.